Thanks to the combination of Elon Musk's concept and Sir Richard Branson's investment, the hyperloop is nearing reality. 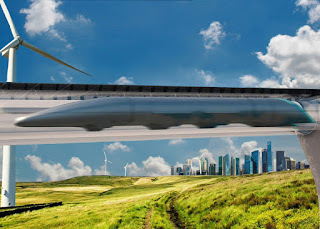 The hyperloop is a pod placed inside a vacuum-sealed tube. By levitating the pod, friction is dramatically reduced which allows exponentially increased speed. This technology combination allows for possible speeds of 700-800 miles per hour. Entrepreneurs globally are attempting to duplicate Elon Musk's vision of hyperloop travel. A Spanish company Zeleros says their hyperloop system is capable of 745 mph. This will allow travel from Madrid to Paris in about an hour, rather than 12 hours drive time. There are at least ten hyperloop concept routes around the world conducting feasibility studies. They include some in the UK, US, India, Canada and Mexico. The one hyperloop route that is ahead of the pact is the one between Pittsburgh, Columbus and Chicago by Virgin Hyperloop One, which is Richard Branson's financial backing of Elon Musk's Hyperloop. It's the first route to hire consultants for environmental as well as feasibility studies. This puts it years ahead of other hyperloop projects. Travel from Pittsburgh to Chicago is estimated to be 45 minutes rather than a 7 hour drive time. The studies for Virgin Hyperloop One will look at the impact on wildlife as well as the infrastructure needed such as tunneling, tubes and pylons. The hope is to use rail and highway right of ways to facilitate deployment.